If you think Apple TV devices are just for entertainment, think again. 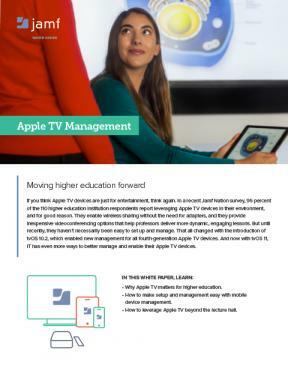 In a recent Jamf Nation survey, 95 percent of the 110 higher education institution respondents report leveraging Apple TV devices in their environment, and for good reason. They enable wireless sharing without the need for adapters, and they provide inexpensive videoconferencing options that help professors deliver more dynamic, engaging lessons. But until recently, they haven’t necessarily been easy to set up and manage. That all changed with tvOS 10.2, which became available with all fourth-generation Apple TV devices. And now with tvOS 11, IT has even more ways to better manage and enable their Apple TV devices. Why Apple TV matters for higher education. How to make setup and management easy with mobile device management. How to leverage Apple TV beyond the lecture hall.